RCT has a series of Heritage Trails which take you on a journey through different areas of the borough stopping off at historic places and Blue Plaque points that commemorate notable people, places and events along the way. Pontypridd is one such trail. 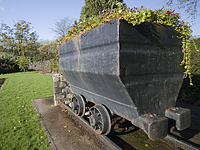 The Ponty walk starts at Pontypridd Museum, at the north end of the town near to the bus station and two car parks. 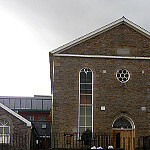 The museum building was the old Tabernacl chapel, built in 1861 to the design of its minister, Edward Roberts. Rebuilt in 1910 at the height of the town’s prosperity, the interior has an exceptionally fine ceiling and art nouveau stained glass. The woodwork is pine from Russia and Poland, a reminder of the international trade created by the coal industry. The pipe organ is still used for concerts. There is a permanent exhibition on the history of the town and a variety of temporary exhibitions including art, science and photography. Outside the museum, turn left and walk over the Old Bridge. The bridge was completed in 1756, after three failed attempts. Its builder, William Edwards, first constructed a three-arched bridge, but this was swept away by a flood. He next attempted a single-span bridge, but the timber supports used during construction were also swept away by the river in flood. His third attempt collapsed under its own weight. 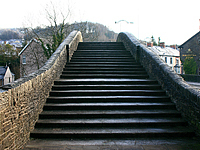 His fourth, the present bridge, has three cylindrical holes each side to reduce the weight of the stonework. With a span of 140 feet Edwards’ bridge was hailed as the first in Europe to exceed the span of the Rialto in Venice. After crossing the bridge walk down Zion Street to get a better view or if viewing the bridge at night look out for the lighting. 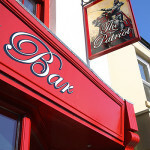 Past the Maltsters Arms, use the pedestrian crossing leading to the gates of the Park. 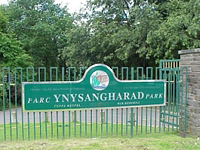 Ynysangharad Park was established as a War Memorial Park after the First World War, and funded by public donations. 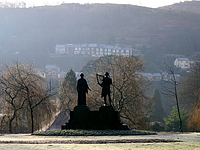 The obelisk which can be seen from the Park, on the hillside to the east of the town is a memorial to the 5th Welch Regiment, whose recruiting centre was Pontypridd. 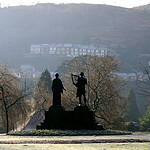 The Park is often described as the jewel in the crown of Pontypridd although often under threat from greedy developers. The bandstand often has live bands in the summer and the cricket ground has hosted international matches. The outdoor paddling pool was popular in summer but has since been closed to make way for the new lido that is about to open. Through the Park gates, continue straight on until you reach the children’s play area on your left. Near the play area is a small drinking fountain, dedicated to the memory of Lewis Gordon Lenox, grandson of Samuel Lenox one of the founding partners of Brown Lenox chain works. 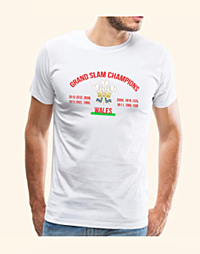 Established in 1818 this works began the industrial development of Pontypridd, and became famous for the manufacture of the best iron chains for ships’ anchor cables. 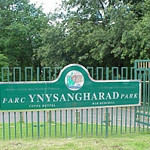 Follow the path which branches off left alongside the children’s play area, and cross the park bearing left to the James Memorial, which commemorates Evan James and James James, authors of the Welsh National Anthem ‘Hen Wlad fy Nhadau’. The memorial dates from 1930, and is the work of William Goscombe John, arguably our finest Welsh sculptor. 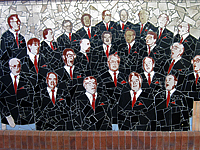 The statues represent Music and Poetry and it is perhaps fitting that Pontypridd still has a wonderful choral tradition and is also home to the international Welsh Poetry Competition. From the James Memorial return to the main path which runs to the right of the bandstand. Turn right towards the tennis courts. 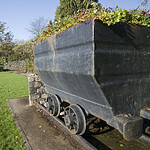 On your right is a beautiful sunken floral garden, with a coal dram in recognition of the important financial contribution made by the miners to the creation of the park. Leaving the Park by the footbridge over the river Taff, and pausing to view the merging of two of Wales’ most famous rivers – the Taff and Rhondda, turn right into Taff St. This is the main, if somewhat run-down shopping street of the town with hideous modern frontages. 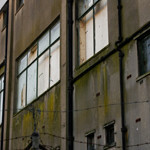 However, if you look up you’ll see the remnants of some lovely Victorian and Edwardian buildings of real quality. Such a shame the local council didn’t preserve more of our heritage and a shame they don’t feel they can re-build / renovate those lost / left. Walk as far as the Fountain, on an island in Penuel Square. This was a gift to the town from Alfred Thomas MP in 1895. Designed by Charles Fowler of Cardiff it features Celtic knotwork derived from the ancient crosses of the Vale of Glamorgan. Look carefully at the four pillars and count the different designs. Return through the Market (open on Weds, Fri & Sat) – the rear entrance is a few yards from the Fountain up Penuel Lane. The Market consists of a group of buildings, the earlier built in 1885-93 in the style then known as Mixed Renaissance, the later in c.1910 in bold Baroque. The shop facades here have thankfully been restored to their original appearance although the back of these buildings are in a dreadful state of repair, with the old town hall particularly ugly, a fire hazard and in much need of renovation. From Market Square turn right into Taff St. and continue up High St. Turn right at the lights into Sardis Rd. 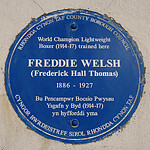 On the wall of the old Clarence Hotel (now an Indian) on your right a few yards along is a blue plaque to Freddie Welsh, who was world lightweight boxing champion from 1914-1917. 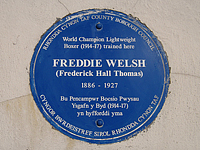 He was born Frederick Hall Thomas in Morgan St., Pontypridd, in 1886 and took up boxing after emigrating to the USA at the age of 16. During his career he fought 168 times, losing only 5 bouts. He was awarded the first ever Lonsdale belt in 1909 after beating Johnny Summers to win the British lightweight title. He died in New York in 1927. At the top of High St turn right at the lights into Sardis Rd. The railway station opposite has its own claim to fame. It was rebuilt in 1907-09, and in order to cope with the number of passengers (11,000 per day) in a location where the narrow valley made it impossible to build several platforms side by side, a single platform was built long enough to allow several trains to use it simultaneously. The station was for many years the longest in Britain. Sardis Road takes its name from Sardis Independent Chapel, across the road on the left. 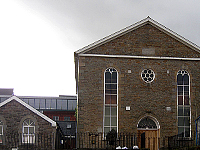 Built in 1834 it was rebuilt only 18 years later to meet the needs of a congregation which was growing with the town. 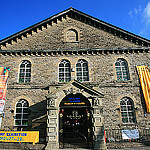 It is built of the local Pennant sandstone, and is now the only chapel in Pontypridd to conduct its services in Welsh. One of its ministers, John Dyfnallt Owen, was a well-known writer; and one of its secretaries, Berwyn Lewis, had been prop forward for Huddersfield. Continue along Sardis Road and cross the river Rhondda. High on the end wall of the first building across the river is a black marble plaque. This marks the site of the small woollen factory owned by Evan James, and his house next door to it. 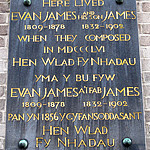 He and his son James lived here when they composed the Welsh National Anthem ‘Hen Wlad fy Nhadau’ in 1856. 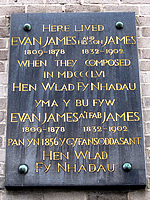 Before moving on, turn around with the James plaque behind you and view the railway viaduct which crosses the river Rhondda, while the main road carries the line to Merthyr Tydfil. The Taff Vale Railway from Cardiff to Merthyr was the first proper railway in Wales, engineered by Isambard Kingdom Brunel (1806-1858), one of the world’s greatest inventors and engineers. The pier which now stands behind the main arch is part of a second viaduct built alongside when the track was doubled. Originally the railway was carried across the river on a single arch of 110 feet, which was as striking in appearance as William Edwards’ bridge at the other end of the town. Here a short detour is worthwhile. The steel steps at the side of the bus shelters just beyond the James plaque lead down to Mill Street, once the main road up the Rhondda valley. 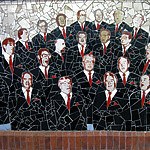 The road now narrows and becomes a pedestrian underpass, lined with murals depicting figures representing the rich and varied musical culture of Pontypridd. Climb the steps back up to the main road and turn right. Across the road is St. Catherine’s church, built 1866-70 by architect John Norton. 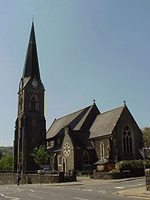 Until then Pontypridd had been divided between five parishes, each with its church a few miles out of the town. The construction of this church therefore marks the establishment of the town itself. Built externally of local sandstone with Bath stone dressings, its interior by contrast is of red and black brick. It has fine stained glass, in particular a set of windows in the North aisle depicting the early history of Christianity in Wales. One of Ponty’s best buildings although the local council did see fit to hide much of the view by building a monstrous car park and empty office space in front of it. Continue along Gelliwastad Road. Set back from the road on the left is the Gelliwastad Institute (private members club/pub), formerly Gelliwastad House. This is the oldest building in the town centre, and was the home of the Griffiths family. Dr. Richard Griffiths (1756-1826) built a horse-drawn tramroad in 1809 which was the first means of transporting coal from the Rhondda valley and also brought miners’ wives to shop at Pontypridd market. This began the development of the town. Continue along Gelliwastad Road to the ‘Muni’ theatre and art gallery. This was formerly a Wesleyan chapel, built in 1895 to the design of the local architect Arthur O. Evans. 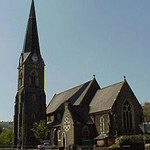 Looking back along the road, the four churches and chapels within 200 yards testify to the prosperity of Pontypridd in its heyday. The Muni does host some good shows but the art gallery seems to have died a death with staff not even replying to e-mails if you were to enquire about staging an exhibition there for example. So no surprise it was run down and sold off to a private company, with the Tory cuts being held to blame, even though it was the most profitable of the three RCT venues. 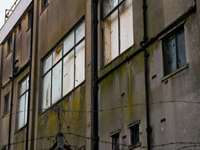 Next to the ‘Muni’ is the former District Council building, which now houses the office of the Mayor of Rhondda Cynon Taff and Registry Office. 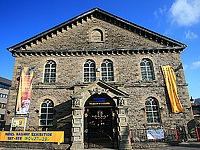 This has been described as ‘far and away the most distinguished building in Pontypridd, a display of restrained Edwardian self-confidence which in its resourceful and original handling of the classical idiom can bear comparison with anything in Cathays Park, Cardiff’ (John Newman- ‘The Buildings of Wales – Glamorgan’). Either side of the entrance are memorial plaques to two distinguished figures of the Liberal nationalist era, Edward Thomas John (1857-1931), MP for East Denbigh and a prominent figure in the Celtic Congress and the Peace Society; and Sir Edward Anwyl, educationalist and first President of the Union of Welsh Societies. 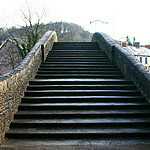 The Ponty bimble ends here, only a short distance from the starting point at Pontypridd Museum, and an even shorter distance from the cafes and pubs of Taff Street, which can be reached by crossing the road and walking down Crossbrook Street. 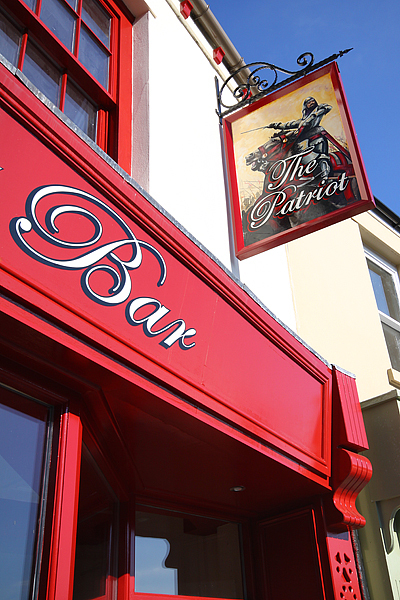 Our tip would be to forget the coffee and treat yourself to a stunning pint of Rhymney Dark or the new IPA in The Patriot Bar on Taff Street. A finer real ale you’ll be hard pushed to find this side of Alaska. Please advise what is the total distance of Pontypridd Heritage Trail. Thanks. The town council should know, or RCT, but I’d estimate about 2 miles?